Labor Chairwoman MK Shelly Yachimovich announced on Sunday her party will hold early primaries on November 14, following the countrywide municipal elections. Yachimovich's maneuver is probably geared toward preventing her rivals within the party from gaining support from the recent wave of new party members, who need at least six months membership to gain voting rights. The hundreds of new party memberships filed in July by Alon Hassan, the Ashdod Seaport chairman who vowed revenge against Yachimovich, will thus be one month shy of their voting rights. "A party that believes in democracy must be democratic in its own right," Yachimovich said in her announcement. "We have our constitution, which determines that party leadership primaries will be held within 14 months. After consulting with MKs and activists, we intend to convene the party committee soon and set a date for the primaries after the municipal elections." The chairwoman said that she will of course run for the party leadership: "I ask again for the trust and support of the party members. I suggest anyone who considers himself worthy to apply. There's no cooling off period for leadership. The day of the inside elections we'll accept the voters' decision and continue on our path." 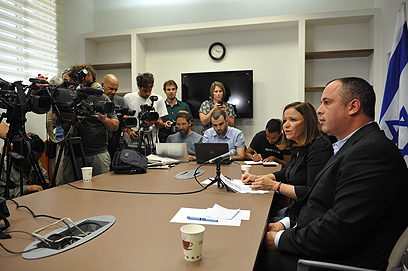 During the press conference, Yachimovich also used the opportunity to jab at the government and said that "we are the defensive wall of 99% of Israelis for whom the State has no regard. This is a government which doesn't keep its word, which broke new records. We proudly lead the political alternative." Yachimovich's rivals in the party leadership bid are MKs Isaac Herzog, Eitan Cabel and Erel Margalit, who voiced their concern at the early primaries, which will check their camps' growth as they will not be able to file new party members supportive of their bid. A Yachimovich associate told Ynet on Saturday: "Yachimovich is acting strictly according to the party constitution, and she will set the primaries to within the next 14 months. She doesn't need to apologize for being strong in the party, and all her rivals had ample time to assemble new members." See all talkbacks "Yachimovich announces early Labor primaries, checks rivals' bid"